GT holding another failed locking device. The bird you see sitting perched next to this article is GT, my mother's nefarious blood-sucking cockatoo, who aspires to nothing more then to plan my untimely demise. I suppose I should start in the beginning, before GT entered my nightmares. 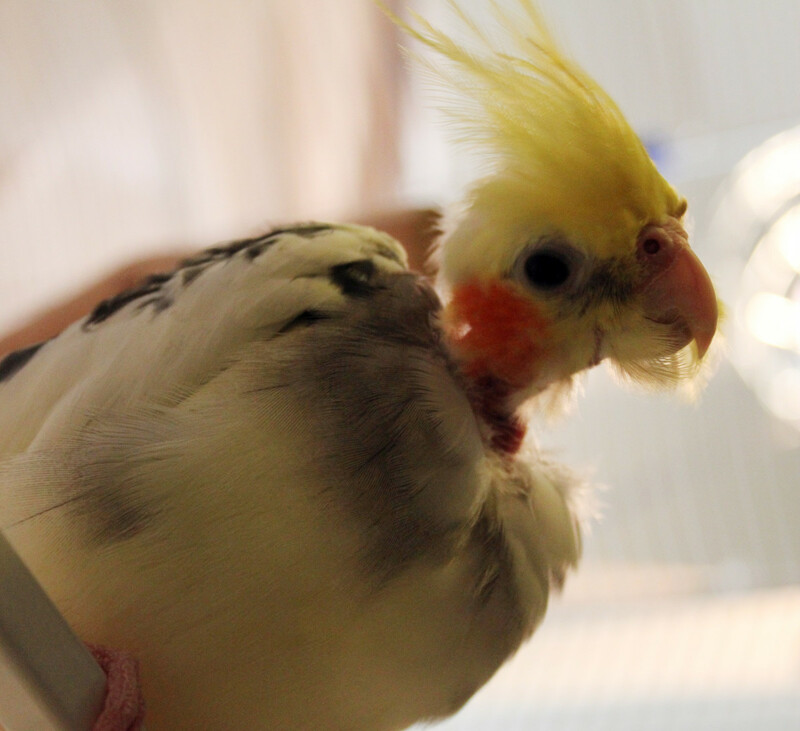 At the age of twelve I helped my mother run an aviary consisting of around 65 birds, mostly cockatiels. I loved hand-feeding the babies and answering customer questions but the birds themselves usually turned against me soon after weaning. 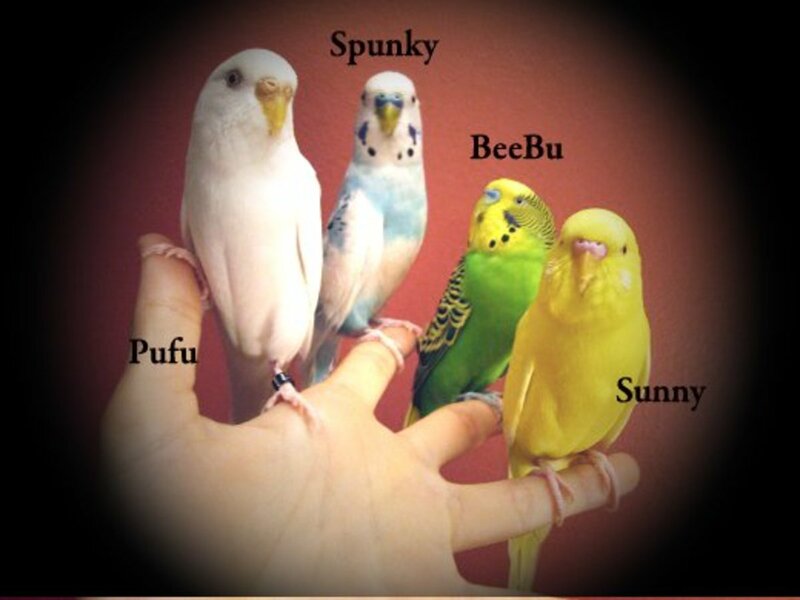 These were the same birds who made loving family pets, learned to talk, and adored every other human on the planet. I never really questioned why this was, I just figured I wasn't a "bird person." It's true, birds are the most conniving, picky, and self-righteous animals on the planet, even exceeding humans in their power to hold onto judgments and grudges. No adult bird ever liked me, except for a few coopfulls of chickens who were too dumb to know better. It didn't matter what I did to appease them. At my first meeting I would hold out a treat, which they'd take indignantly and go back to staring me down with the evil eye and hissing. I was never intentionally mean to a bird but that didn't matter, they all were part of a conspiring global club that had me on their black list. There was only one species of bird that actually liked me, those were the African Grey Parrots, you know the ugly ones with all the brains. 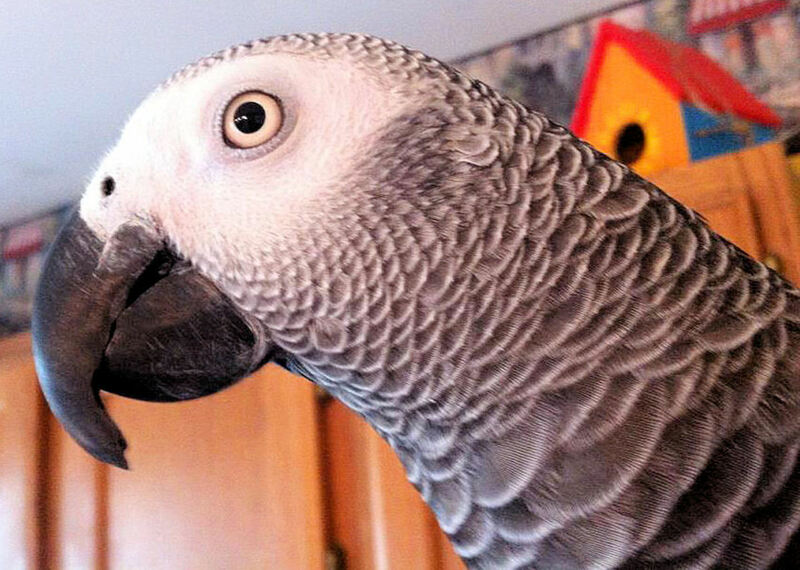 This isn't that surprising since African Greys are the rebels of the bird world. They tend to hate everyone except people the other bird species have black listed. 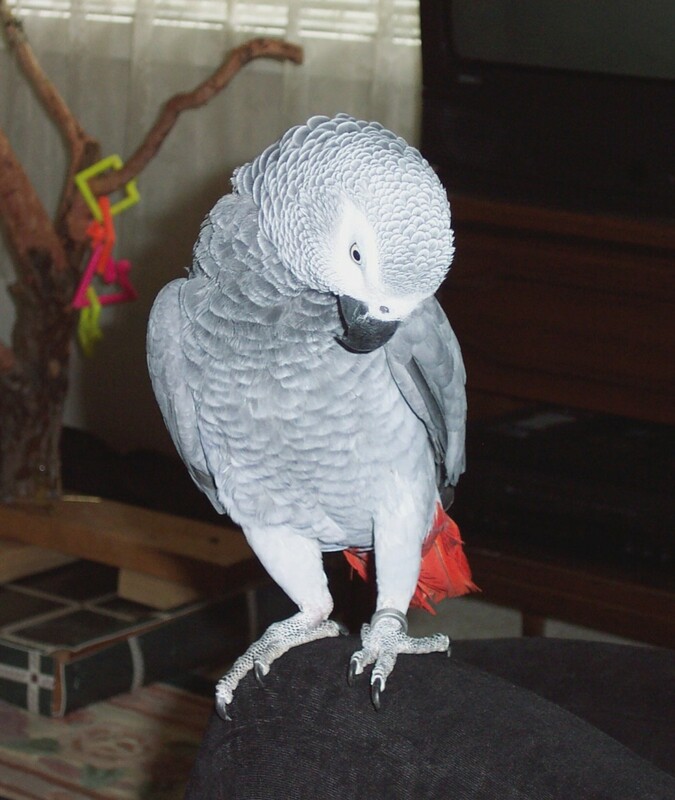 I had noted that for a long time people either had birds or an African Grey, rarely did they have both, and when they did the African Grey was usually penned up like some vicious tyrant, which any bird can be given half a chance. My mother had decided sometime in here that she wanted a larger parrot. The cockatiels were lovely but she wanted one of the birds that could destroy an entire house in an hour sharp, swear louder then a trucker whose arm just got lopped off, and outlive her by a great many years. In specific she wanted a cockatoo, one of the crested parrots who are usually white and intensely cuddly with their owners. So one day we were in a pet store and she noticed a baby Goffin's Cockatoo who was just being weaned. She fell in love. Though I didn't do a thing besides look in his general direction the bird took an immediate dislike to me. His little black beady eyes were aflame with malicious intent. I just knew it. Goffin's Cockatoos are the smallest of the cockatoos and are the most devious in the fact they will escape anything you put them in given enough time to plot. My mother named him G-Too (short for Goffin's Cockatoo) because she's creative like that. Eventually that got shortened to GT because being lazy English speaking Americans we disliked having to spend so much time pronouncing the whole thing. I tried everything to be on this bird's good side. I fed him treats, I cooed sweetly at him, and gave him spray bottle showers (which he adored.) I even made him toys. This didn't matter. The bird was an unfettered moody God in his own right and he knew it. I shouldn't have been surprised when his glowering turned into biting. He didn't bite everyone, just me, repeatedly, no matter what I was doing. He'd fly across the room just to attack me, which was no small feet since his wings were clipped. When his feathers were too short he'd flop to the floor, sneak up on me, and bite at my ankles, hard! Eventually it got so bad I demanded he be locked in his cage when I was around. It was just as well. Cockatoo experts will advise new owners to put their parrot "in the most active room in the house so they can enjoy the people going by." Parrots are after all incredibly needy both emotionally and intellectually. What they didn't say was there are some exceptions, to psycho birds. 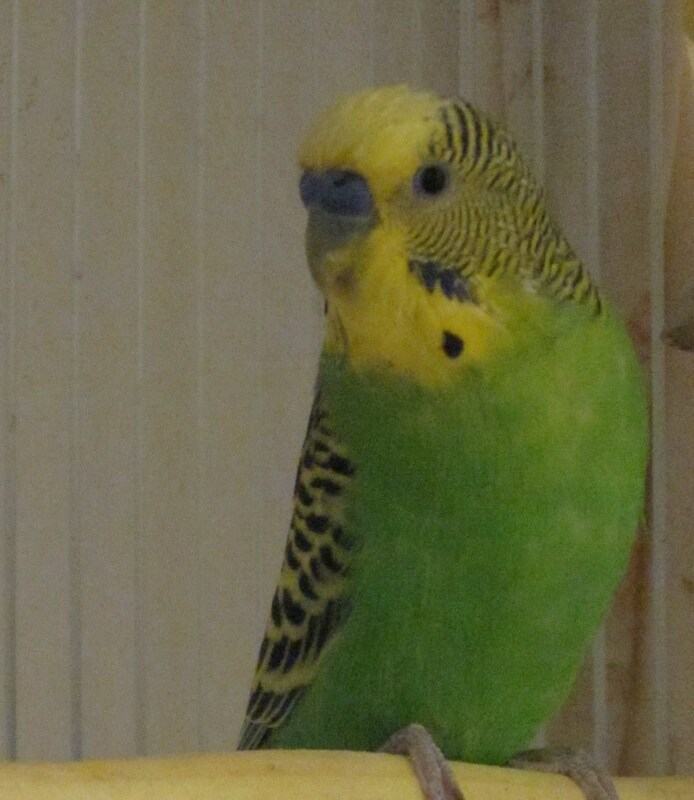 GT would attack me and scream for hours, rocking back and forth like he had Tourettes, and just generally be an unhappy bird whenever his cage was in an active part of the house. He wasn't appeased until he got his own room, locked away, where he finally settled down and stopped trying to kill things. 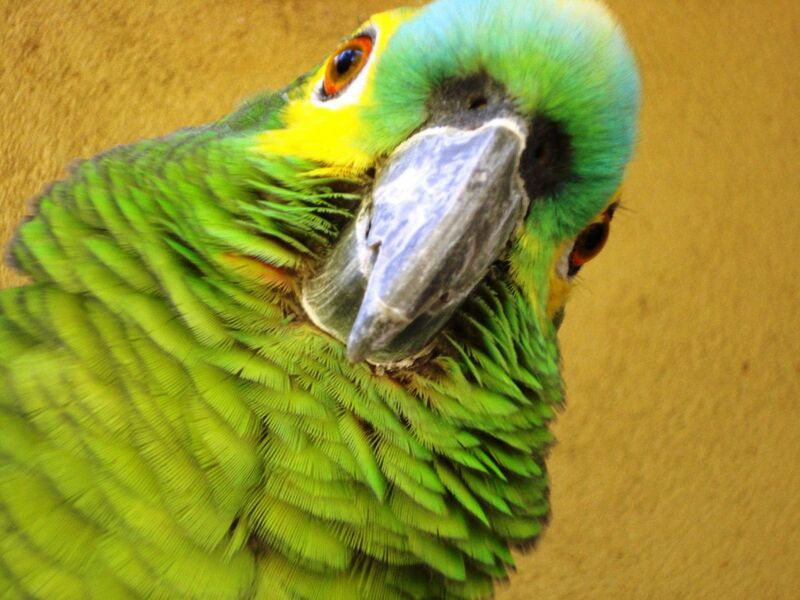 Parrot experts tell us locking a bird away where it isn't with it's human for 1-4 hours a day is the worst and most detrimental thing you can do. The experts never met GT. One time we again tried putting GT in an active part of the house, this time it was in the hallway where he could have some mental stimulation but not too much. The bird acted like stimulation was a form of crack. I had no idea the ferocious fowl had spent all day slowly turning the hinges on the door of his California Cage in a bid to get out. When I was minding my own business walking down the hall I did notice that his door was flopped on the floor but I didn't see the bird anywhere in sight. Stupidly I thought nothing of this and went to walk over the door when something hit me with the force of an oncomming train. Before I could figure out what was going on I felt the sharpest pain of my life. The bird was clinging onto my shirt and biting my chest as hard as he could, drawing blood and giving me scars in the process. Without thinking, or even knowing what had attacked me, I instinctively grabbed the attacker and flung him clear across the house. The bird landed with a thud on the floor but got up unfazed, shook his head and took three steps toward me before thinking better of it. He had actually methodically planned out his cage escape and had sat in ambush on top of his cage just waiting for me to walk by. Of course I felt bad for sling-shotting him across the house. It's not in my nature to abuse animals, but needless to say I kept my distance from him from then on. Goffin's cockatoos have been known to live into their 50's and because of this it's unlikely my mother will outlive him. This is a crying shame when you think about the fact he's bitten everyone he could have been possibly willed too, damning himself to an incredibly unpredictable future. Currently you can find GT in his room, sitting in his cage, babbling drunkenly to himself because he's too damn lazy to make actual words come out. I know this because he could say hello when we brought him home. After he came here he knew he didn't have to impress anyone and let his speech decay to infantile babble, absolute gibberish only he and his imaginary evil twin can understand. Since getting GT I have learned that cockatoos are psychotic birds. Yes, they can be super sweet and cuddly with people they like. However these are also the birds that are nearly impossible to breed because both males and females in "bonded breeding pairs" have been known to tear off each other's toes whenever they're pissed at each other, which apparently is frequently. They also can decapitate their own children by biting their beaks clear off in infancy, and are not too good to rip out their mate's feathers in giant hunks. When a mate isn't available and they haven't had enough mental stimulation they'll keep occupied plucking themselves bald. Such charming creatures they are... GT apparently is the exception to this rule as he's always been in perfect feather. I have a cherry head conure and a blue crown conure. What people don’t realize is birds mate for life whether it be with another bird or a human. If you have one bird it may pick you or you spouse for it’s mate. If it chooses one of you the other may never get near the bird. My two conures are bonded so I just tend to let them be by themselves. On the other hand, I have a Derbyan parrot I acquired about a year ago when she was 17. She loves anyone that walks through door. Also, if my birds flew at me and attacked me, they would not be flying. My conures are 25 and 27 and I have had them since they were under a year old. I also have a 31 year old cockatiel. My babies are out of their cages all day and I am never attacked. Also for those of you that have taken in birds from previous owners, you may never bond with them. Just be patient and love them for who they are. Sorry to hear that, I feel your pain! I'm not really sure why people keep those feathered demons but to each their own! I have an umbrella cockatoo. Your story really hit home . Don't have a bird (honestly not too sure how I got here), but your life is terrifying! Facing that menace on a daily basis... How do you do it? This story made me lol. I also learned an awful lot about cockatiels, and am thankful for not being a bird person:). Hah! I have a little demon living in my house too! She's my partner's goffin minion and I secretly wish for the day she will naturally die or have a heart attack brought on by her apopolectic fits. I'm terrified of her having been bitten repeatedly to the point of gaping wounds and blood. In truth, I can't stand her now and leave the room when she is brought in to it. I feel for you! I shared a house with a screaming banshee (cockatoo) for some time . . . the experience sent me into a downhill spiral of nervous anxiety, horrible nightmares, and off to the psychologist. It was absolute misery. I also tried everything to be the bird's friend - to no avail. I am amazed that you are still holding on . . . you sure have a way of expressing their evil, conniving little personalities. My housemate has a great sympathy for birds and recently brought home a cockatoo that some acquaintance of hers didn't want. 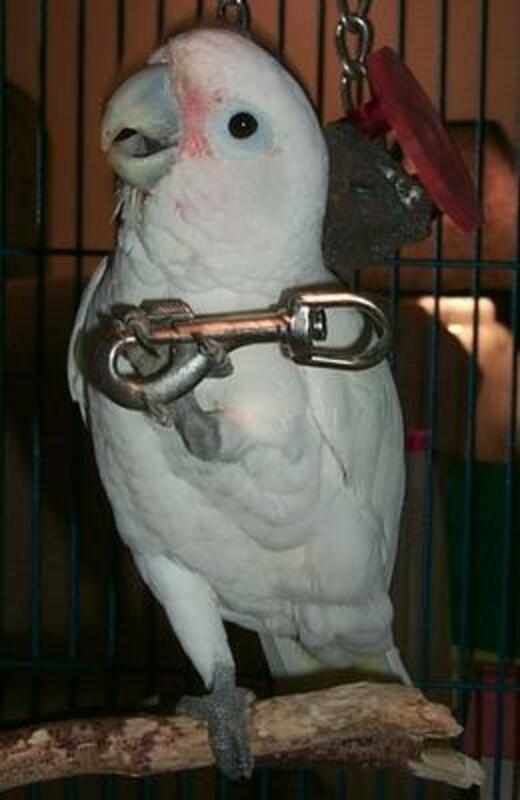 I dearly wish I was a horror movie producer because the very first thing I would show on the screen would be this cockatoo screaming, his head in a pulsating fury, his white plumed crown raised like a warriors shield. As the cameras back up you see the bird with wings outstretched, flapping in some mystic vibration, his ear piercing screams so absolute in viciousness that you become convinced that there is without any shadow of a doubt a place called hell! Suddenly the bird stands straight on his perch and begins swinging round and round the stick, right side up, upside down, faster and faster, his face turning once again towards you, beak opening shutting shrieking, eyes intent on ripping you to shreds if only the bars of the cage were not there... I could go on! What a phenomenal beasty! I call it Satan's pet. 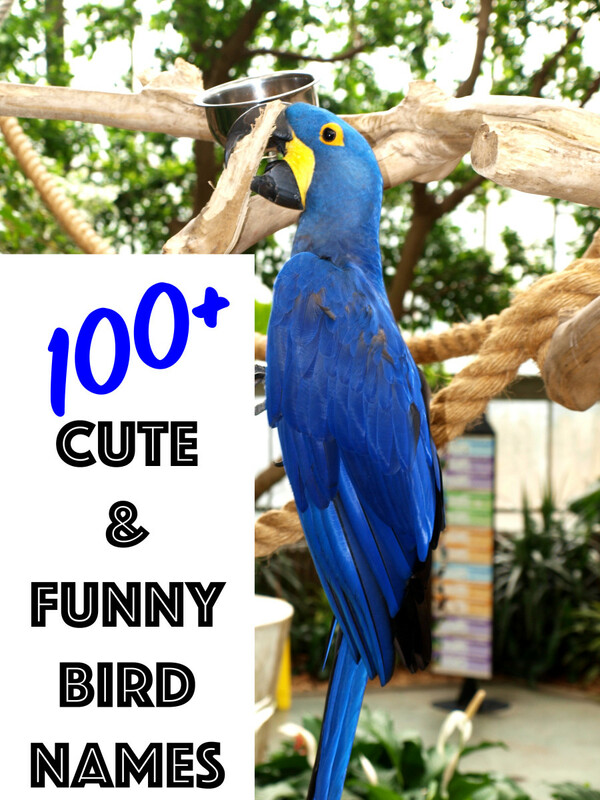 THIS STORY WAS SO FUNNY, BUT SAD,I HAVE A GREY WQHO IS LIKE THAT WITH ME AND I SAVED HIM FROM A BAD HOME,HE GETS EVERY THING,CAGE CLEANED EVERY DAY ALL KINDS OF FRUIT AND FOOD STILL HE IS A GET,BUT I WONT STOP TRYING TO BE HIS FRIEND. I found this post whilst looking for information on vicious parrots. 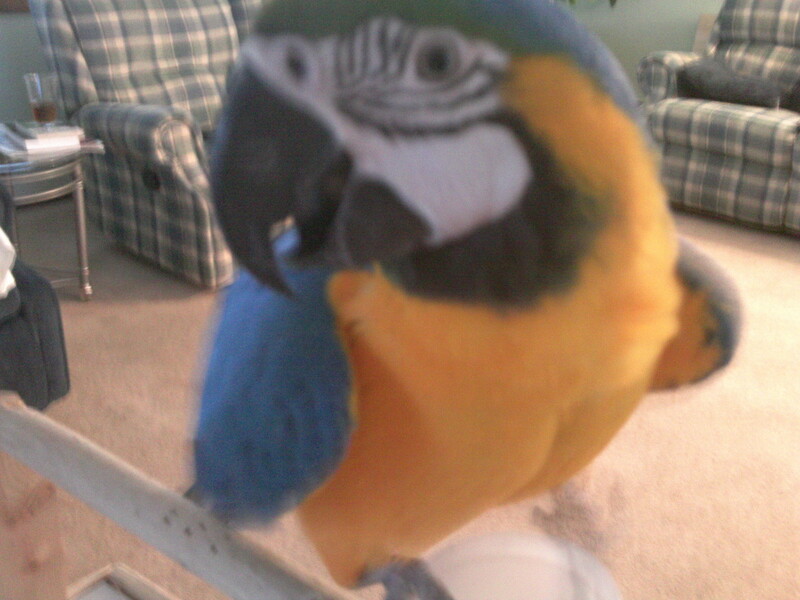 I have a Military Macaw. He's bitten every inch of my body including my face, taken off a thumb nail like a pop can top, throws his food back at me when I fill his bowl and there is no end in site. I've had him for 10 years. I can't give him away for fear he'll hurt a child or something. He's a menace - very smart, and even charming when he wants to be, though. Your story made me feel better. At least I'm not the only one loathed by a bird. I feel for you! My daughter has an Eclectus Parrot and he is very demanding, cunning and vicious. The Australian Cockatoo is another menace. The other night four young males cockatoo's went on a scandalous raid, ripping ends of TV antennas on four houses while screaming at the top of their voices. Like a bunch of uncontrolled teens they were! I must say I got a great laugh out of this hub, and I love birds despite recognizing as you do what devils they can be. So what do you do to stop from being eaten alive and going deaf?? I think I have his cousin Buddy who was my cuddle bug now he just bites me for no reason 4 times this week alone he Loves my Husband. Yeah, darling little GT does that too (go in search of bare skin to take a bite out of.) It's one of his more endearing qualities... 'toos are such odd creatures! Glad someone else is on their blacklist! Cockatoos are manipulators and love, love drama. Especially drama reactions. Nothing gets the larger parrots going more than some screaming and jumping around because of something they've done. This is frequently why they become hard-core biters. A lot of the stuff you mentioned about 'toos come from them being wild animals in the wrong enviroment. They can be good companions, it just takes constant work and attention. Well, not all parrots (or cockatoos) are psychotic but it does take a special person to give them what they need... You may be surprised to know that some American and European birds (perhaps some that have fallen from trees) can sometimes talk. In fact crows and ravens are eerily good at speech if they've been around people too much. Just something to keep in mind... in case you ever hear one say Hello or Paully wants a cracker. :) And oh yes, I came across someone whose parakeet could speak 300 words and heard rumors of talking zebra finch (though I was unable to track down evidence of this.) Never let size fool you! I love this hub, one of the best I've read so far. I know very little about birds, but now at least I know to stay away (far, far away) from cockatoos, especially vicious, scheming ones. I had always pictured cockatoos as cute, cuddly birds, but this hub certainly cleared up that myth! Excellent work, very well written. That's all I can say. I do honestly feel sincerely sorry for you with this bird, but what a hilarious story! I guess I can laugh from a safe distance! I believe dog's can smell a person that fears them. Now I have added this Mind zeroing bird to the dog chain. Has this bird been paired with one of the Dog people?